Available light can influence the community composition as well as the biomass and productivity of benthic algae. Most evidence suggests that there are differences in the responses of the major groups of algae to irradiance. Green algae usually are associated with high light levels, and diatoms and cyanobacteria appear to require lower light intensities than do green algae (Hill 1996). Motile algae are able to avoid extremes by movement along the light gradient, while nonmotile, prostrate taxa that grow near the substrate may decrease in abundance when light levels decline as a result of shading by overgrowth of the algal community. Becoming dormant or heterotrophic may allow some non-motile species to persist during conditions of very low light. Seasonal changes in periphyton in the Meto-lius River, Oregon, can reasonably be attributed to variation in light intensity and photoperiod because other environmental variables including temperature, current velocity, dissolved substances, and turbidity are essentially constant throughout the year in this spring-fed system (Sherman and Phinney 1971). Benthic algal abundance declined during winter, presumably because of reduced light, and some diatoms such as Diatoma hiemale were restricted to the spring-summer time period. However, of the 60 species sufficiently common for detailed study, only nine were seasonal while the rest occurred throughout the year, suggesting only minimal influence of changing light regime on taxonomic composition. 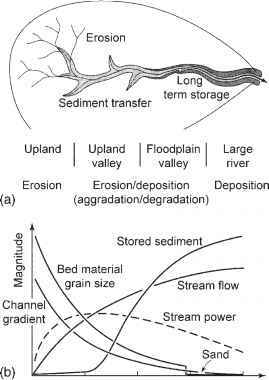 Light can be a limiting factor in small streams under dense forest cover, as evidenced by a number of studies that have observed enhanced periphyton growth after forest harvest permitted more light to reach the streambed (Murphy and Hall 1981, Keithan and Lowe 1985, Lowe et al. 1986). In tropical streams of Hawaii, chlorophyll was significantly higher in partially shaded than in heavily shaded pools. When P was added to test nutrient limitation, chlorophyll increased in partially shaded pools, but not in heavily shaded pools, indicating that benthic algae usually were light limited in heavily shaded areas (Larned and Santos 2000). When photosynthetically active radiation (PAR) was reduced by 60%, 90%, and 98% using shade cloth in experimental channels set up alongside a New Zealand pasture stream, algal production decreased consistently under the highest shade treatments and frequently under 60% shade, whereas algal blooms were common in unshaded troughs (Quinn et al. 1997). The tree canopy can block more than 95% of PAR, and so shaded streams commonly experience irradiances below the level at which photosynthesis is maximal (Hill 1996). A comparison of light reaching two headwater streams in deciduous forest versus an open site for reference documents the rapid diminishment of light following leaf emergence (Figure 6.3) resulting in a rapid decrease of primary production by periphyton (Figure 6.4), which in turn may reduce nutrient uptake and the food available to herbivores. 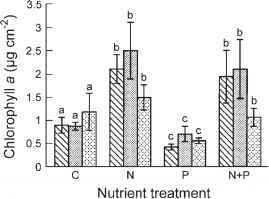 Although some physiological acclimation by algae is possible, it is insufficient to compensate for light scarcity (Steinman 1992, Hill et al. 1995).